When you’ve waited roughly 10 years for a new vehicle model to arrive, a lot of questions are in your head by the time you get your hands on the replacement. This is inevitably what's happening with the new-generation Toyota Fortuner. Apart from the cover story for their February 2016 issue—go out and buy a copy!—our car-loving pals over at TopGear Philippines were able to get some seat time with the midsize SUV’s 4x4 2.8 V and 4x2 2.4 V variants, thanks to a series of events Toyota Motor Philippines recently held. After trying out the new Fortuners on the track and on some rough, sandy terrain, here’s what they learned about the much-awaited SUV. 1. Does it look good? If you liked the photo above, then you have a possible future where you will pause for a minute every morning and admire the Fortuner in your garage—maybe longer if you have good time-management skills. Toyota’s new SUV has a grille that reminds us of the Volkswagen Touareg’s front. It also has strong flanks and a rear end that belongs to a higher vehicle class. 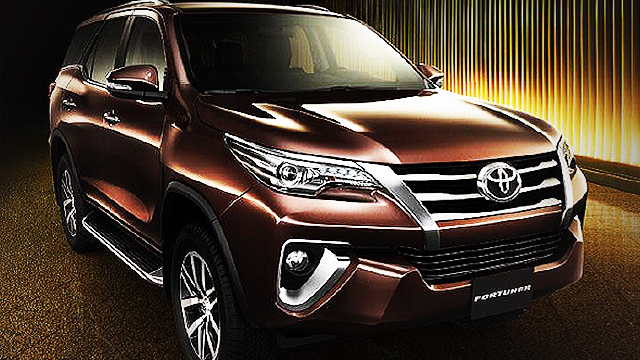 The new Fortuner finds a balance between elegance, size, and aggressiveness. It depends on where you’re coming from, and how much power is enough to convince your senses of visceral motion. The 2.4-liter turbodiesel in the 4x2 is definitely not lethargic, with its 147hp and 400Nm. On the track, we were able to experience its more-than-adequate ability to accelerate and corner. But the 2.8-liter V variant and its 174hp and 450Nm is something else. After the scheduled test-drive period was done, we asked for an extra driving opportunity with the top-spec Fortuner, just to have more seat time with it. Part of the course was a dirt road leading to a sandy path beside the beach. We had a blast speeding over the loose sand. On asphalt, the acceleration is rapid and confident. Within reasonable expectations, no one will ever find the 2.8-liter powerplant lacking. It’s really a shame that you can only get it in the most expensive variant. Sublime. That's the simplest way to describe it. When it was introduced, we noticed how good the outgoing Fortuner’s interior was—it felt more expensive than its price category. That perception continues with the all-new replacement. In the V grades, the cabin is made of classy hues of black and brown. The steering wheel and the transmission console have dark faux wood trim, while dark-brown and black leather lines the dashboard. We felt the material, and it feels premium. The seats are done in brown leather and have excellent support when, theoretically, you’re doing donuts on an empty sand lot beside a beach. Again, we have to disclaim that we have soft and yielding bodies. We think we are more cushioned than most mortals, and we're starting to suspect a conspiracy in the automotive industry to fatten overfeed the media. But we can feel a harsh ride, and the new Fortuner definitely didn’t have one. We drove over rocky paths and some bumpy sand dunes, and it was all comfortable fun. For the full list, visit TopGear.com.ph, where this story first appeard.